can this be used with the new drone mobile system? hi, it’s very interesting. can I do this on the new S-Class? thanks! I’ll be doing this shorty for my smart start, will it only work on my local network, or will I need to setup multiple servers for my home/work locations? Pushing the home button on your phone, and then talking to Siri is more complicated than pushing the vehicle start button on your remote. How do I install this siri proxy to my iPhone 4s? any update on siri tutorial video? Now that the iPhone 4S has been jailbroken via the dream team, will your hack show up there sometime? 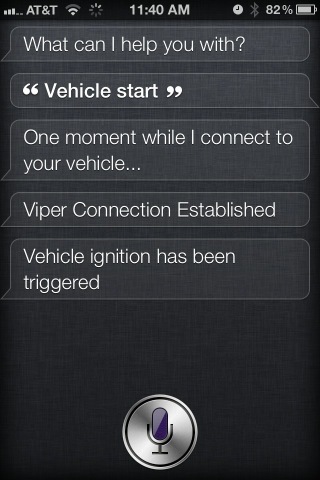 I have the Viper 5900 installed and the Smart Start module as well and would love to be able to do this with my iPhone. Awesome job by the way! can I do with 2010 subaru legacy? Dan Cronin I am crazy busy right now, but will try to do a tutorial video soon. Yes if it has a Viper Security System with SmartStart. How would I be able to do this if I had the viper Smartstart like you? Hi, Great post- can I do this with my VOLVO S60? “put stupid fog/xenon /leds light off’ the drivers around us are blinded bij the light, Siri. I would suspect it uses similar technology, and could probably be done, but since I do not have a Cadillac or the credentials to use to test with the Cadillac Onstar app, I really cannot be certain. do u think the same thing can be done to a cadillac with factory remote start? I think it is a Viper 5900. The guys at the stereo shopped hooked the SmartStart add-on right to it with no problems. Originally, I didn’t think it would be compatible either. keep up the effort….gud job. what model viper alarm was that? cause that looked like an alarm that not smartstart compatible. Obwohl Siri noch Beta ist, geht da schon Einiges ab! Wir werden da in der nahem Zukunft noch tolle und nutzerfreundliche Anwendungen sehen! Innovative attempt. News article related to it in my blog – http://www.cosmogeek.info/2011/11/siri-hacker-siri-can-start-stop-lock.html. Previous Previous post: Load Balancing Frustration – Arrrggghhh! !